The adoption of the document was approved by 302 votes out of 348. The upper house of the French parliament has adopted a resolution on easing the EU sanctions on Russia. However, although the existence of the document will exert a certain pressure on the French government, it is non-binding and is unlikely to have a significant effect on French or EU policy on sanctions. 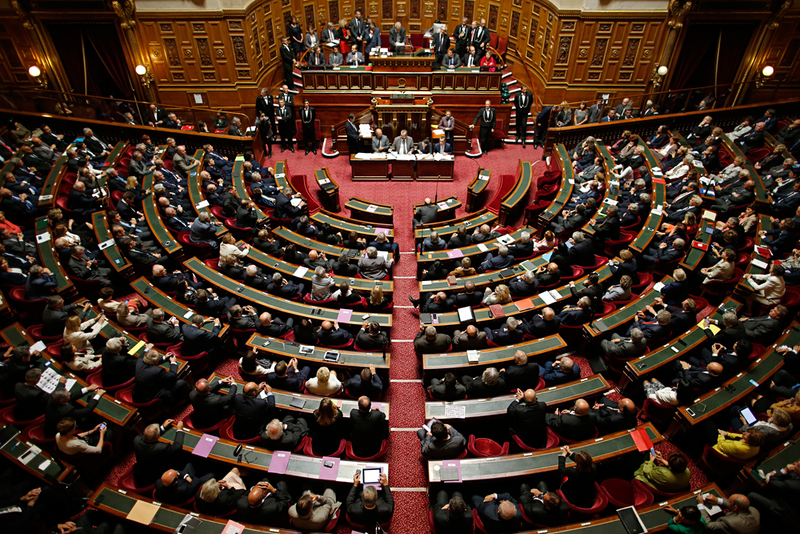 The upper house of the French parliament – the Senate – overwhelmingly adopted on June 8 a resolution calling for a softening of sanctions imposed on Russia by the EU following Moscow’s takeover of Crimea in 2014. The adoption of the document was approved by 302 votes out of 348. The resolution is non-binding and only urges the French government to support a gradual softening of the sanctions when the EU addresses the issue. The resolution also recommends the abolition of personal sanctions against Russian parliamentarians to facilitate dialogue between the two countries. According to Russian experts, the resolution will not have a significant impact on the fate of sanctions against Russia. The Kremlin, according to the presidential press secretary, Dmitry Peskov, welcomed the adoption of the document, but again noted that the issue of the lifting or extension of the sanctions is not included in the Kremlin's agenda. Earlier, in late April, the lower house of the French parliament, the National Assembly, also adopted a non-binding resolution, which urged the French government to oppose the extension of the EU sanctions against Russia. Discussion on whether or not to extend the sanctions will be held in Brussels in late June. According to Kortunov, this is the first time that the upper chamber of one of the leading European countries has adopted such a decision, and it strengthens the position of those who advocate the easing or lifting of sanctions. The fact of the approval of the resolution – moreover, overwhelmingly – exerts political pressure on both the French government and the EU bureaucracy, according to Kortunov. So now the French authorities "will take a much more flexible position than other countries within the framework of existing procedures in Brussels." Although the resolution is non-binding, the very fact of its support by such a majority in parliament is important," Emmanuel Quidet, the chairman of the Franco-Russian Chamber of Commerce, said in an interview with RBTH. "The fact that the parliament of France, a European country and one of the major players in the Minsk peace process, voted in favor of these two resolutions is an important development," said Quidet. It will now be difficult for the authorities to do nothing in view of the fact that the country's representative body stands for the lifting of sanctions as the Minsk agreements are implemented. Although Quidet does not foresee any sharp change in the position of the French authorities on sanctions, he believes that the parliamentary vote will certainly have an impact on government policy regarding sanctions against Russia – perhaps we will see this in several months, he said.